If you collect championship rings, you have many choices when it comes to storing them and displaying them. You may want to display some rings in solitary splendor, but you may want to display others as a set. Still others you may want to safely store. There are several cases from which to choose. Rings displayed in this clear, acrylic championship ring display case are held by a plastic ring clip. The beauty and details of the ring's design are in full display as it apears to float above the wood base. The case features a two-piece, slide design, and a mirror inlaid in the mahoghany-stained base reflects the ring. The base measures four inches square and stands one and one-half inches high, and the case measures three inches on each side. The ring clip can be removed from the stand should you want to lay the ring on its side on the mirror. If you prefer a wood box, this cherry wood jewelry display box may be the one. The box has a cherry wood stain and features a domed top. A tab clip holds the ring in place. The box is two and one-half inches square and stands one and seven-eighth inches high. The box provides a beautiful setting for a championship ring, but, depending on the size, not all rings will fit. Another choice is this one , also made of cherry wood. It features a glass lid and has a space to display a plaque beside the ring. This box measures six inches by four inches and stands two and one-half inches high. Acrylic championship ring cases are available for four, five, and six rings. The rings are held by plastic ring clips and set on clear, plastic posts. These three cases all have a black base. However, the six-ring case has a mirrored back and is made of one-eigth inch cell cast acrylic that has been polished and waxed inside and out to reduce distortion and provide superior optical clarity. If you would like to display a large group of rings together, this seven-row display case offers seven rows of dividers. The burl wood box is lined with faux suede in a light camel color. The matte finish box features a lucite panel in the lid. It measures nine inches by five inches by two and one-quarter inches. 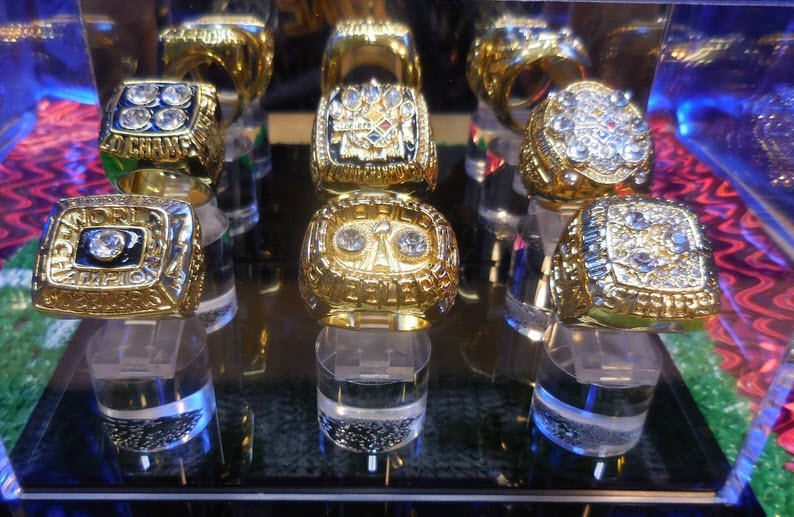 If you want to simply start a ready-made collection, there are some custom-made team display cases that come with replica rings for various franchises that have had success in the four major sports. Whether you are looking for storage or display cases, one of these suggestions should meet your needs.